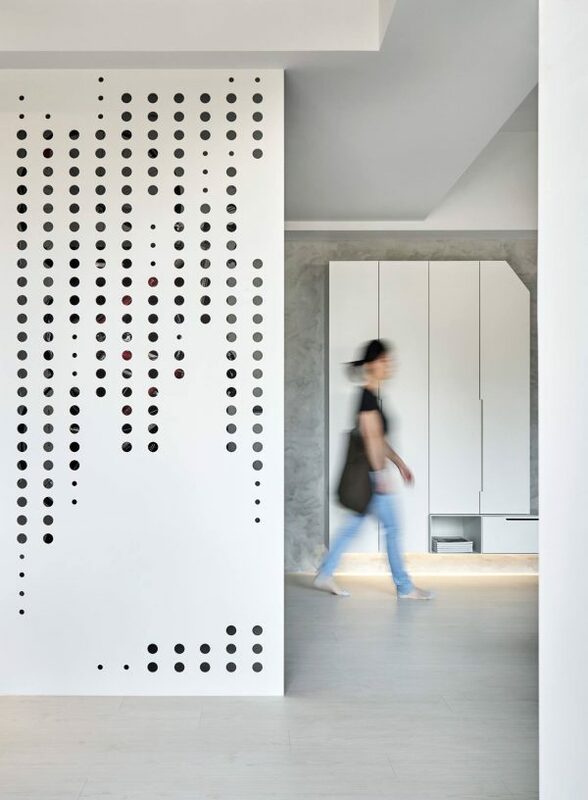 At the heart of the city, two young professionals cohabit in a 140.5 square metre apartment, designed by Fungo Design. 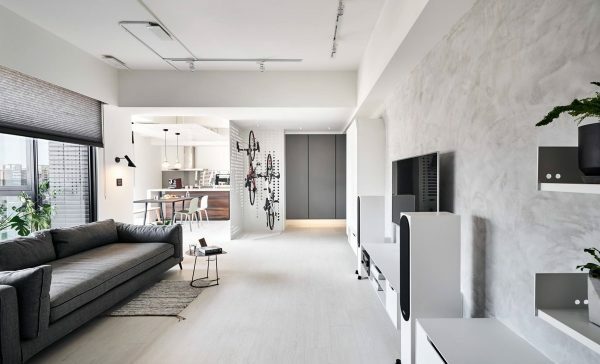 The modern interior is a vision of white, pale grey and subtly industrial style touches that give the place a cool edge without appearing like its trying too hard. 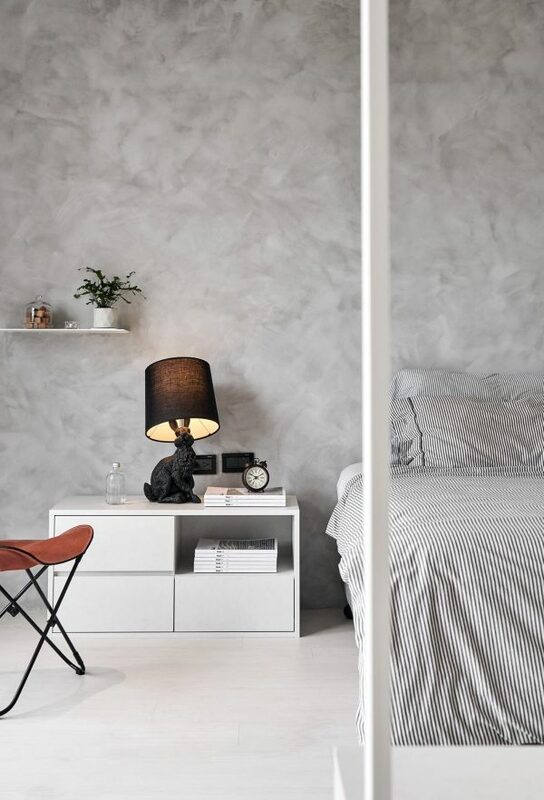 Concrete feature walls span the open space, knocked back by fresh white storage furniture. 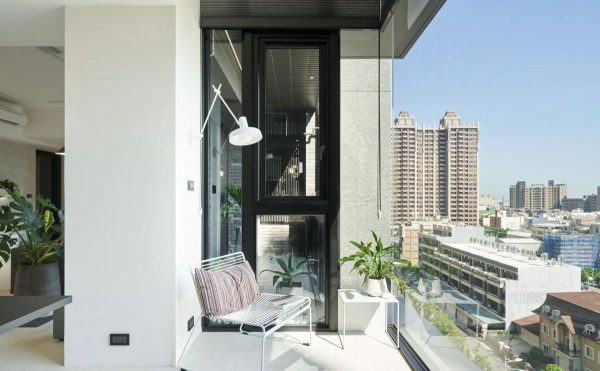 Sweeping city panorama decorates one entire side of the apartment, negating the need for distractive room adornment. 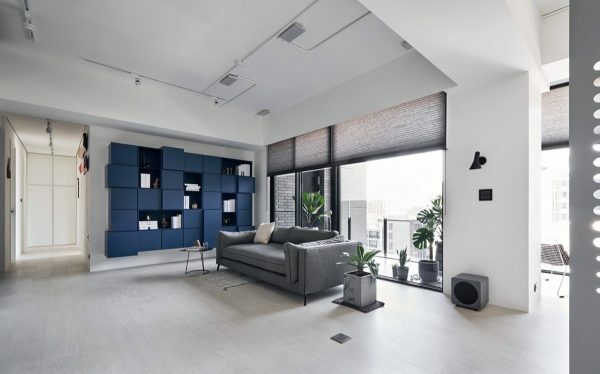 Occasional colour breaks into the simple scheme, including a wall of blue units, scattered green house plants and just a couple of reddish toned accent pieces to warm things through. 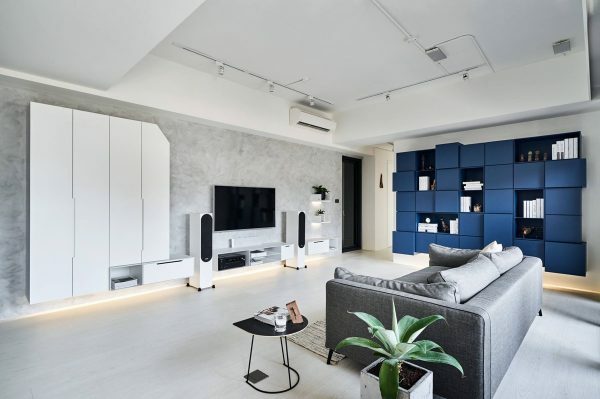 A spacious grey and white living room spans much of the interior space. 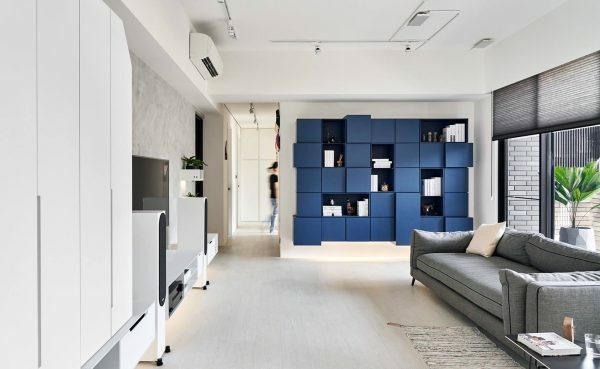 On one side of the room there is an installation of storage units that form a blue feature wall. 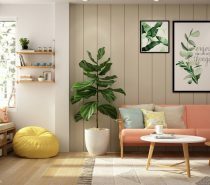 A grey modern sofa sits at the centre of the layout, which is teamed with a chunky concrete planter and a small side table for drinks. 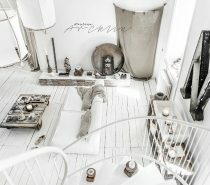 Pale plank flooring, white ceilings and light walls makes the room appear bleached out. 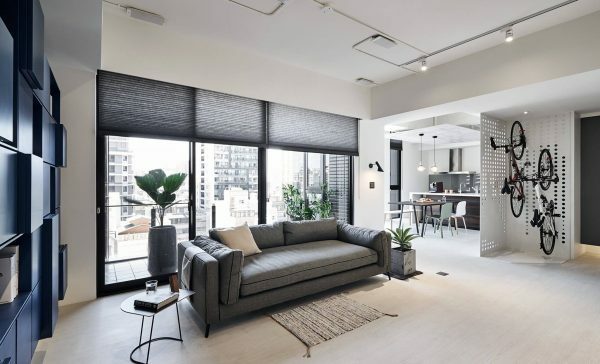 Natural light flows in through a run of floor to ceiling windows. 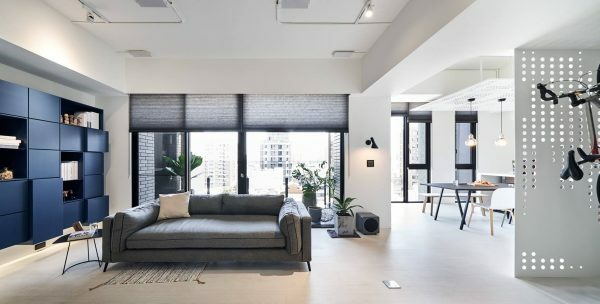 The windows are dressed with grey window blinds that have been selected to match the grey fabric sofa. A tiny area rug sits in front of the sofa, just to keep feet cosy on the cool floor. 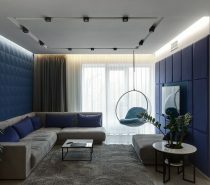 Simple lighting skims the ceiling line, with no low hanging pendant lights filling the upper quarters of the lounge. The small black modern wall sconce providing perimeter lighting between the windows is the AJ Lamp. 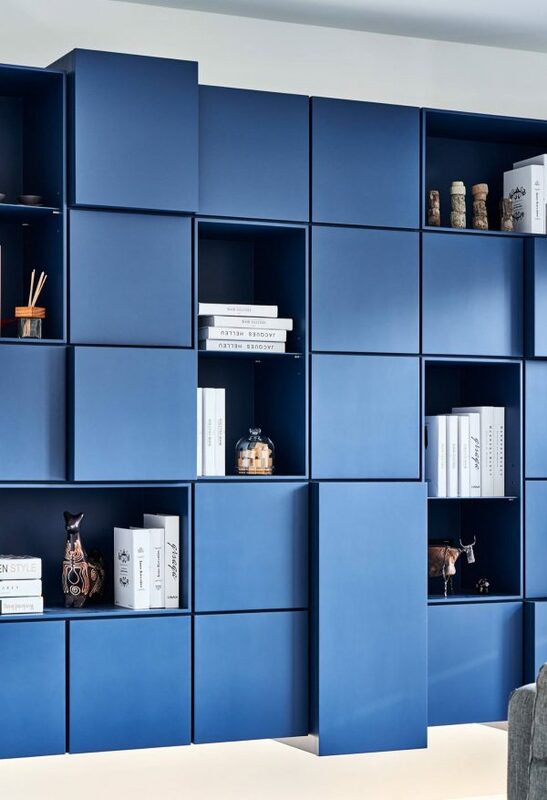 The cluster of blue home storage units extrude at different depths, which creates the illusion of movement. 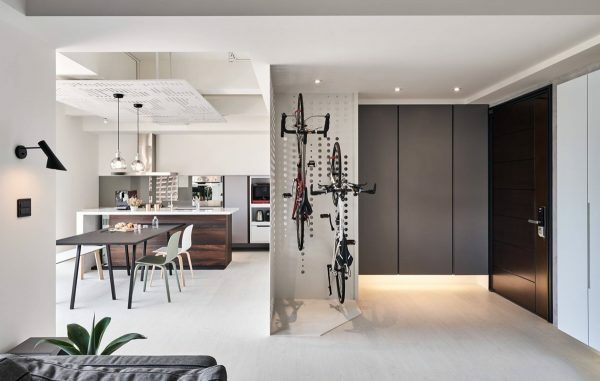 Open shelving is dotted between the concealed cabinets to allow items to be set out on display. A special selection of books, trinkets and animal figurines fill the cubbies. 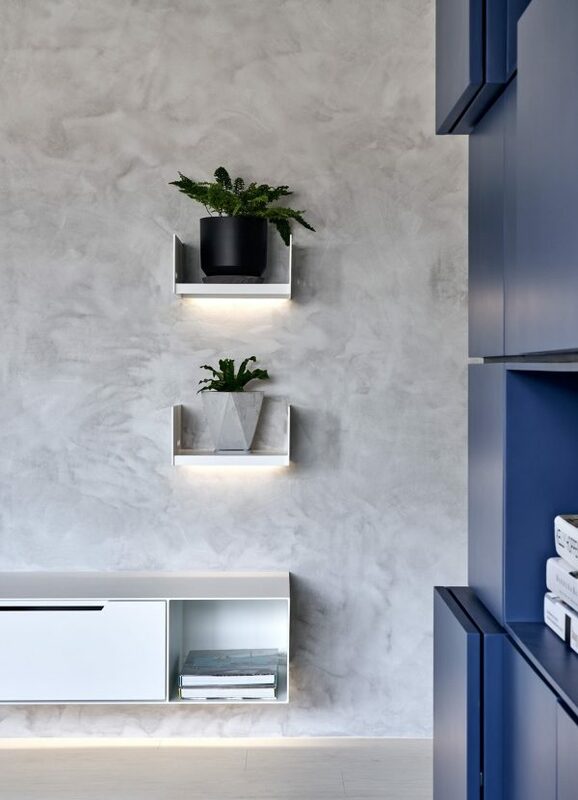 A set of illuminated wall shelves hold a couple of indoor plants over by the tv. 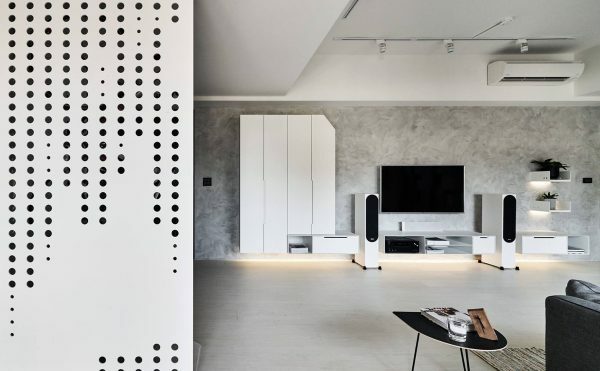 White media storage units have been mounted at intervals along the concrete tv wall. 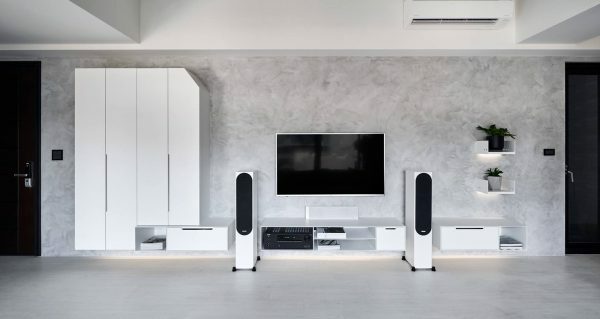 Tall white speakers are settled into the gaps between the media cabinets. … The panels form a bicycle storage point, with the addition of two bike racks. 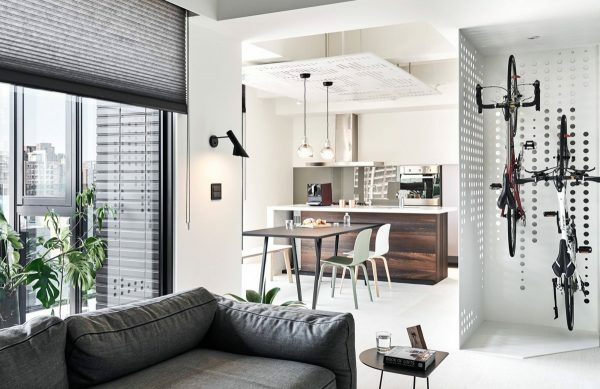 The bicycle racks can be seen from the living room, but the view just adds to the young city vibe of the apartment interior. 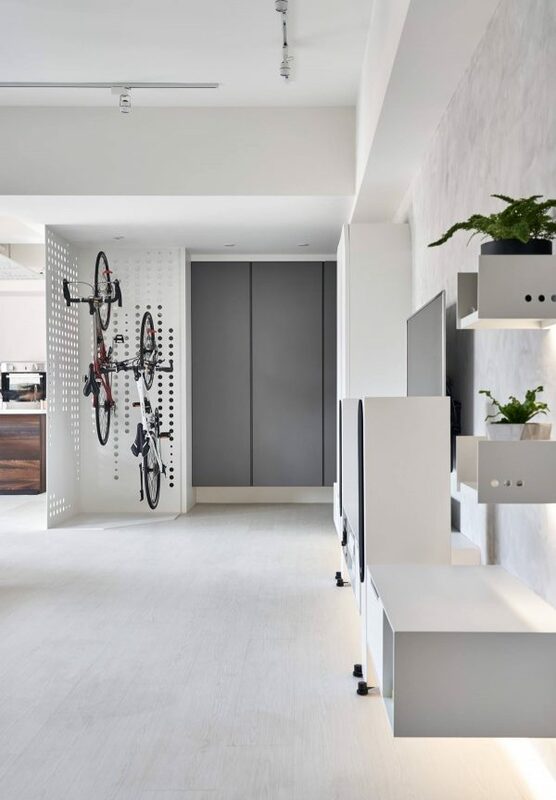 Living room shelving quietly echoes the aesthetic of the bike storage nook, having metal sides that follow a similar perforated design. 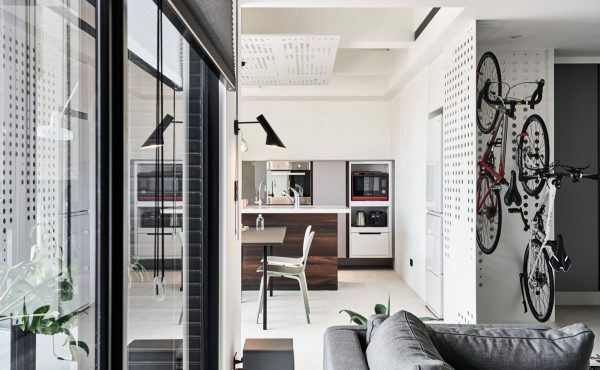 A kitchen diner runs straight off the lounge, giving the apartment an easy free-flowing living space. 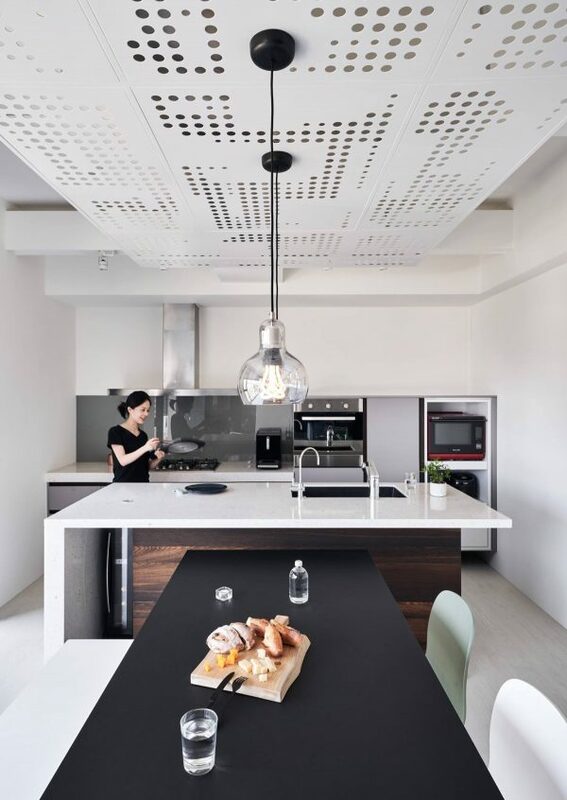 The ceiling of the kitchen diner sees a repeat of the perforated metal sheet design used for the bike storage nook, but this time it’s pendant lights that hang from the panel. A fridge freezer is nested into a wall recess at one side of the kitchen to free up more wall space for cabinets and other appliances. 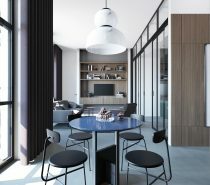 Sweeping city views can be enjoyed whilst dining at the table. Along the window side of the table, a low dining bench has been opted for in place of high-backed seating, so as not to obscure the impressive panorama. Around the corner to the dining spot, a little reading nook has been fashioned by the window. The flood of sunlight provides a wonderfully bright ambience by day; a wall reading lamp lights the nook at night. The metal frame reading chair is made comfortable with a soft scatter cushion. 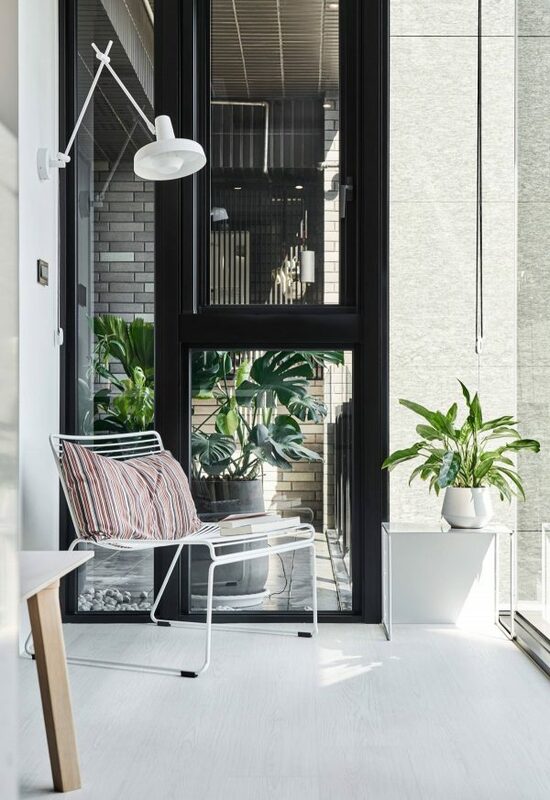 The red striped fabric of the chair cushion contrasts with a green indoor plant on a side table, and with the plants that can be seen out on the balcony beyond the window. The red hue also matches with a red microwave oven over on the opposite wall. 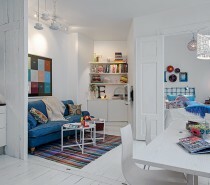 Mismatched colour dining chairs and a contrasting table make up a relaxed Scandinavian style dining room. 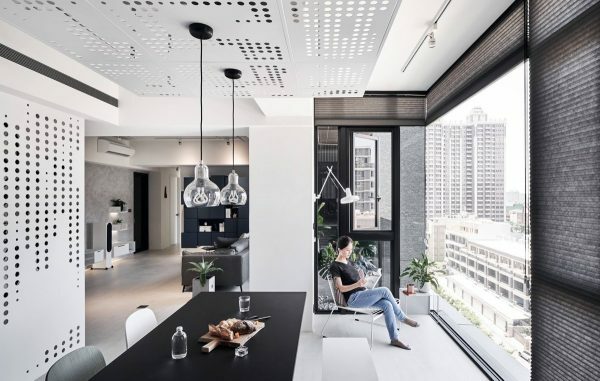 The glass dining room pendant lights hang from black wires and ceiling roses, which match the strong black frames of the windows. The grey and white kitchen holds a low line, with nothing installed above head height. A large kitchen island with sink dominates the layout. 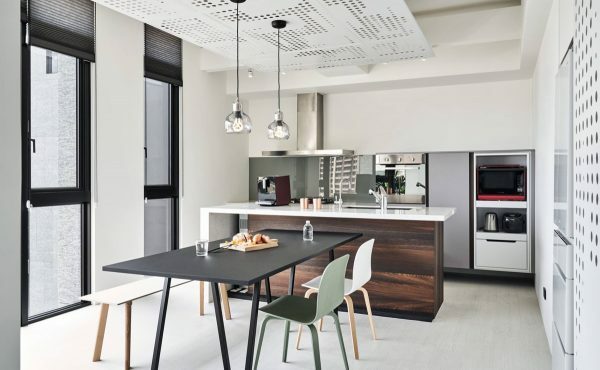 The minimalist kitchen is kept almost completely free of adornments, with just a small planter on the worktop and a wooden cutting board on the dining table. 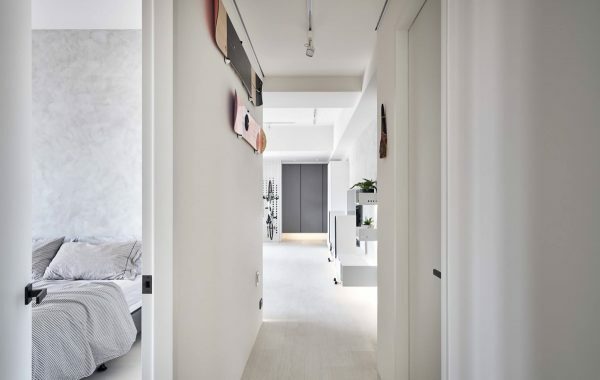 A small hallway runs off the side of the living room to the master bedroom. 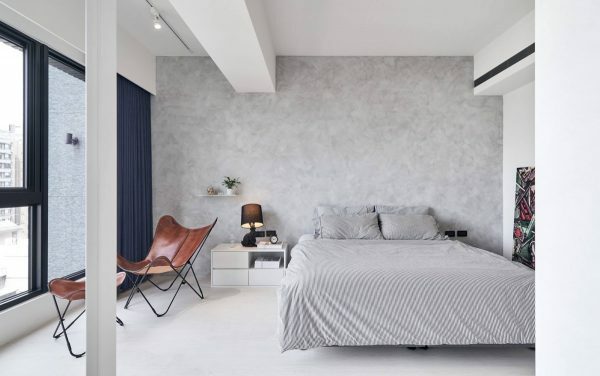 The master bedroom is another minimalistic space, decorated in grey and white. The double bed has no headboard to speak of, and the bedside unit is a set of basic white drawers. A brown leather butterfly chair and matching footstool bring a warmer tone into the room. The bedroom chair and footstool set relaxes by the window, where they contrast with deep blue window drapes. A desk clock sits atop the bedside unit, along with a whimsical Rabbit table lamp by Front for Moooi. One slender wall shelf holds an indoor plant in a geometric planter over the bedside. 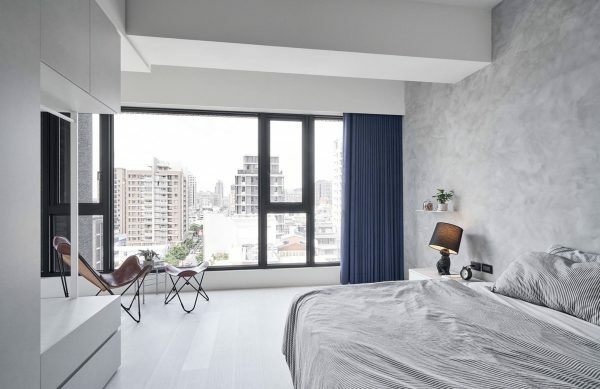 The city view acts as decoration in the plain the room. 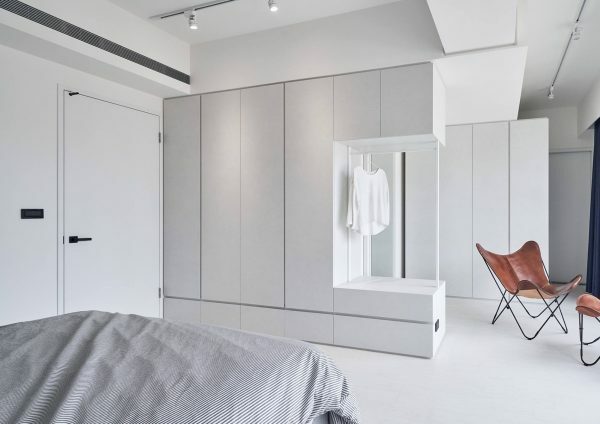 Opposite the foot of the bed, there is an arrangement of handleless slab front white wardrobes. The white closets have been installed in a formation that makes a separate dressing area.